WHAT TO DO WITH THE SEEDS? POST FOLLOWS..
Kashmiri chilli powder - 1 tsp. Select mangoes which are very firm and wash well. Peel the mangoes and grate it. Discard the seeds. Keep aside. In a heavy-bottomed pan, heat oil, add mustard seeds. When it splutters, add asafoetida and turmeric powder and add grated mangoes to it. Add salt, chilli powder and stir frequently till it is cooked and oil leaves the sides. Finally, add the fenugreek powder and give a quick mix. Best side dish for curd rice. It can also be mixed with hot rice, ghee and gingelly oil and this thokku sadham will taste excellent. NOTE: Generally, we use regular chilli powder and I have used kashmiri chilli powder also to get a rich colour. 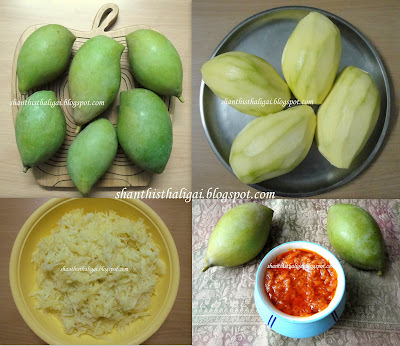 finger-licking pickle.. wow so tempting..
Mango thokku looks tangy and yummy. Mouth watering! And the colour is indeed a plus point. I am drooling here Shanthi jee and seriously wondering what you are gonna do with those mango seeds ! Slurp,droolworthy thokku..I'll do sambar with those mango seeds, waiting eagerly to know wat you did with them. Wow yummy and finger licking pickle. looking forward for your next post with mango seeds. Yummiee! I used to like this a lot.. but never made it..
yum yum manga thokku and my hot favourite. Shanthi, I have to try it...bookmarked! Nice thokku, just wondering how long does it last?